This group of nine girls spent all year completing the Agent of Change Journey and planning a service project. After researching needs in our community, they selected the Ralston House, a safe place for kids who have been hurt or seen bad things. We visited for a tour and asked for input on their needs. In the end, the girls chose to hold a snack collection to fill the cupboards of the Ralston House. They like to offer kid-friendly snacks to the children and families who visit them to make them feel comfortable. After planning, the troop made a presentation to the principal of their school and gained approval to hold a week-long snack drive. Then they created flyers, classroom presentations, and shopped for sample snacks to direct their classmates on what to bring. Plus 171 boxes of Girl Scout cookies and more than $100 in gift cards. Every year during the Girl Scout Cookie Activity, Girl Scouts across the state of Colorado adopt a “Hometown Hero” that they ask their customers to support through donations of Girl Scout Cookies. One of the groups that many Girl Scouts select as their “Hometown Hero” is the military. The military love receiving shipments of Girl Scout Cookies, and often send letters of thanks like this back to Girl Scouts. Join us for our mural celebration! Are you excited about the mural going up on the building walls outside of the Denver Girl Scout office? We certainly are! And we feel there’s no better way to celebrate its completion than to throw a party where you’re all invited! Please join us on July 13th from 4 to 5:30 p.m. at our office at 400 S. Broadway in Denver. There will be yummy Girl Scout Cookies, as well as ice tea and lemonade served. RSVP to Jeanne Hughes at jeanne.hughes@gscolorado.org by July 11. View the event invitation here. For more information on this project, including photos and videos of the project, read our previous blog posts. Want to win free Girl Scout Cookies? We are conducting a mural photo and video contest via social networking for a chance to win free Girl Scout Cookies! Visit our Facebook page for all the details. This year for Earth Hour on March 26th, Girl Scouts from across Colorado gathered at the Colorado State Capitol in Denver for an evening of environmental action and educational activities. Read more about this event, as well as view the new video created by our girl reporters for the evening. View more photos in Girl Scouts of Colorado’s Flickr gallery. Linda Baker, 9th grade, and Savanna Inman, 10th grade, are Girl Scout Seniors in Troop 66 from Rocky Mountain High School in Fort Collins. Linda and Savanna competed this year in two different robotics community teams in Northern Colorado. 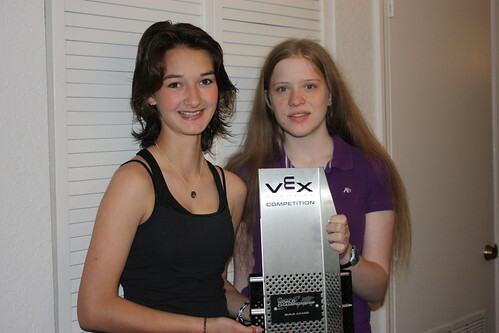 Their VEX Robotics team built and programmed a robot that is under 18” in size, and competed in Berthoud, Loveland, Logan (Utah) and at the VEX Robotics World Championship in Orlando (Florida) April 13-17. Their team of five freshmen and sophomores competed with and against more 500 teams from around the world in matches and interviews over a period of three days. The team ended up winning the Build Award, which is presented by a panel of judges to the team that has constructed and programmed the best robot consisting of mechanical and electrical components. The girls’ Lego Robotics team built and programmed a robot that is under 12” in size and is pre-programmed to perform missions autonomously to earn as many points as possible in 2 and half minutes. They also participated in a research project to measure and record gait disorders in elderly people. The team won the second-highest award at the Colorado Championship in Denver. Linda joined another team to compete in the North American Open at LegoLand in California against 76 teams from the United States and Canada May 21-22. Linda’s team there won the highest award for Gracious Professionalism, which encourages high-quality work, emphasizes the value of others, and respects individuals and the community. 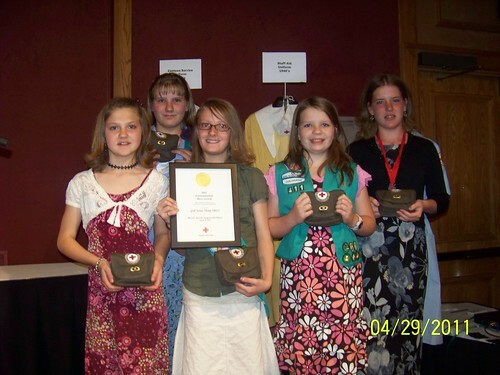 On April 29th, the American Red Cross Western Colorado Chapter honored an area Girl Scout troop with one of the organizations top honors – the Real Heroes Award. 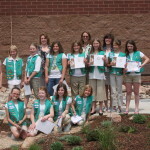 During the spring of 2010, Girl Scout Troop 411 of Cedaredge joined Girl Scouts across Colorado as well as the nation in organizing a community action Girl Scouts Forever Green project in their community to benefit the environment. project that they are still being used at the school today. Seventeen out of eighteen classes at the school participated in this project. The only one class who didn’t participate did so because the class had no other light source. Eight classes were able to keep the lights out all day, and all others did so at least half the day. The winning classes received prizes. The school saved approximately 142 kilowatt hours in just the one day. And its estimated thousands of dollars would be saved if the school did it every day. Delta Montrose Electric Association provided a grant to these Girl Scouts to offer information to all students about saving energy at home as well as at school. A pledge card was given to all 450 students who participated saying they would use less energy at home and school. This troop’s story and honor gained area media coverage. One of the stories was done by KJCT-TV in Grand Junction. I just wanted to let you and Girl Scout Council know what a good deed the Brownie girls of Troop 2251 out of Westminster did this weekend. The girls thought “since we sell cookies, why don’t we make cookies…but for dogs.” So at their troop meeting the girls found a doggie treat recipe online, made and baked the treats, then donated the tasty treats to the German Shepherd Rescue of the Rockies Shelter. Representatives from the Rescue Shelter arrived with one of their dogs and gave the girls a great introduction into what a Rescued Dog is and taught the girls important safety tips on being around dogs and dogs that they’re not familiar with. The doggie treats were a huge success with all the dogs that got to have their cookies. Janice, Me and Hayden were invited to speak at Brownie Troop #2251 about rescued dogs and safety. We took Hayden to be our spokesdog and he was much loved and very well behaved – except when he decided to steal some dog cookies the girls baked for us right off the counter, but the girls thought that was pretty cute. Janice is a natural with the kids and Hayden had a blast. I also enjoyed all the excitment that “the little people” have to give. 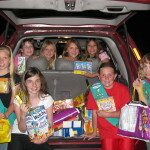 Troop 931 Delivering GS Cookies to Military 2011, a set on Flickr. This year Girl Scout Troop 931 from Colorado Springs sold an amazing 25,144 packages of Girl Scout Cookies! Girl Scout Troop 931 loves Girl Scout Cookie time, and with 12 of their parents actively serving, the girls also hold a special place in their hearts for our United States military. 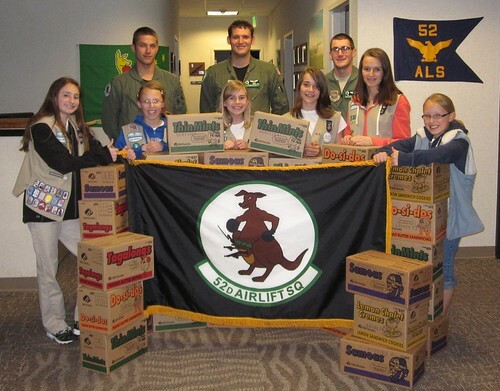 A few weeks ago, Girl Scout Cadettes from Troop 931 took a trip to Peterson Air Force Base, armed with 140 cases of Girl Scout Cookies. The girls were given a tour of the base from officers bound for deployment early the next morning. The girls were even allowed to board a C130 and learn some of the inner workings of the airplanes and highlights of navigation before shaking hands and thanking the soldiers for their service. The cases of Girl Scout Cookies were off the next morning, alongside the officers, bound for Afghanistan. The girls of Troop 931 love setting high goals, and this year they were building on success, selling 22,931 packages last year. Girl Scout Troop 931 was extra motivated this year because they are saving to go on a cruise to Alaska in July, among other activities. These 21 girls gave up their nights and weekends from January through the second week in March, traveling all over the community selling cookies door-to-door, at sporting events and in front of supermarkets to reach their goal. In fact, the Colorado Springs Gazette recently profiled this troop and all they’ve gained through Girl Scouts and selling cookies. Through the Girl Scout Cookie Activity Girl Scouts hone their goal setting, money management, decision making and people skills. They also discover more about business ethics and how to give back to their local community. Girl Scout Troop 931 teamed up with Girl Scout Daisies and Brownies for Booth Sales in front of retail locations, learning valuable leadership skills as they taught the younger girls how to sell cookies and count back change. How else will Troop 931 celebrate their success? Hiking, camping, spelunking, slumber parties, movies, theme parks and overnights at the mall and aquarium. They will also use a portion of the proceeds to fund their Silver Award projects, the highest award a Girl Scout Cadette in middle school can earn, and various community service projects for next year. 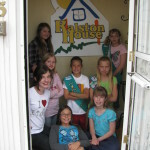 The Girl Scout Cadettes of Troop 931 would like to thank their parents for all of their hard work during cookie sales. They drove girls to booths, hauled cookies, and stood in the rain, wind and snow to help their daughters achieve their goals. The girls know couldn’t have done it without you! Ellie Wroble & Butterfly, a photo by Girl Scouts of Colorado on Flickr. Being a Girl Scout isn’t just selling cookies and singing around the campfire. Being a Girl Scout means you get to change things into something more beautiful. It took three tries for our Girl Scout troop to finally be able to help graffiti the Girl Scout of Colorado headquarters. After weekends cancelled because of horrible weather, we managed to get an absolutely spectacular day. We were assigned the piece of wall that goes down the stairs to the basement. When we first arrived at Girl Scouts all we saw was a plain wall with blue outlines. Graffiti and tattoo artist Chris “PhEud” Bernal was the lead artist, working with Johnny Santos of the Gang Rescue and Support Project. Chris explained how to control the paint and the process that we were about to go though. We were allowed to choose our colors to take the flowers and butterfly outlines into vibrant beautiful colorful paintings. In a matter of less than four hours, the wall was transformed with countless colors and shapes using only cans of spray paint. When you first think of spray paint, you don’t think of much except a can with paint in it that you can spray. Spray paint turns out to be way more complicated and interesting then we all first thought. It turns out that spray paint isn’t all the same. There is spray paint from America, Europe and more. We used spray paint on the wall mostly from Europe in order to get more vibrant, stunning colors. The European spray cans are much easier to spray and have colors that drip less. By directing the cans in certain directions and holding the cans different lengths away from the wall, we were able to change the painting style. It was incredible to see the transformation using only spray paint. Painting doesn’t have to be with a brush on a canvas. It can be on a wall with spray paint. But the simple act of adding color to a blank space can transform it forever. Watching the Girl Scout building evolve and transform with color and beauty has been amazing. We as a troop consider ourselves to be very lucky to be able to help with the process to graffiti (legally!) the Girl Scouts of Colorado Denver office.